Cartels are a blight on fair commerce and anyone even peripherally involved in one can expect to be hit hard in the pocket. In a case on point, a company that refused to participate in an anti-competitive conspiracy was nevertheless fined £130,000 for exchanging pricing information in breach of the Competition Act 1998. The cartel involved the four principal players in the provision of certain equipment. Following an investigation by the Competition and Markets Authority (CMA), the four were found guilty of bid-rigging, price-fixing and market-sharing over a prolonged period. Three of them received fines totalling more than £2.6 million, but no penalty as regards the main cartel was imposed on the fourth after it alerted the CMA to its existence. The company which the four had attempted to recruit to the cartel was a new entrant into the relevant market. 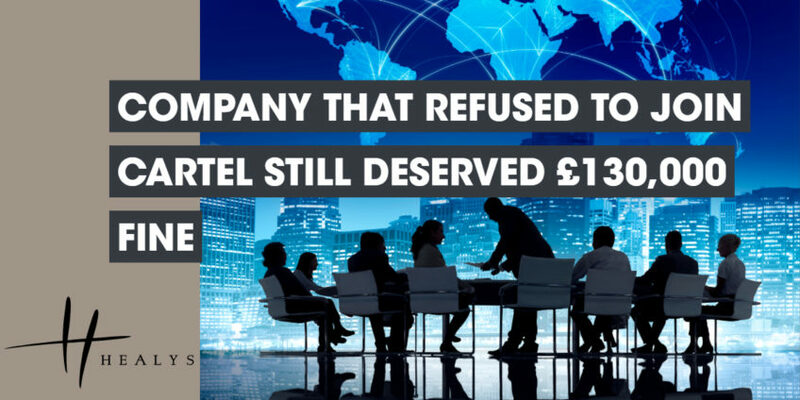 Despite being put under significant pressure, the company’s managing director made clear at a hotel meeting – which was covertly recorded by the CMA – that it wanted no part of the cartel. The CMA accepted that the company had no involvement in the main cartel, but imposed the fine on the basis that words spoken by the managing director at the meeting amounted to participation in the exchange of sensitive pricing information. The company’s challenge to that decision was subsequently rejected by the Competition Appeal Tribunal. In dismissing the company’s appeal against the latter decision, the Court of Appeal noted that it evidently felt indignant about its treatment. However, the CMA’s decisions were neither inconsistent nor had it adopted an impermissibly strict approach. Although one of the cartel members had escaped punishment and the others had received no separate penalty in respect of exchanging information, the fine imposed on the company was not inconsistent with the equal treatment principle.